CIO - CTO Chief Information Officer Length of Employment - In a survey of companies in the United States, South America, and Europe, Janco has found that CIOs jobs are not very secure in the current economic conditions. Janco has seen a fairly steady change in the CIO positions. The median length of employment for CIO in their current companies is approximately 4 years and 5 months. There are a fair number of CIOs who have been in their positions for over 6 years, however many of them are close to retirement age. 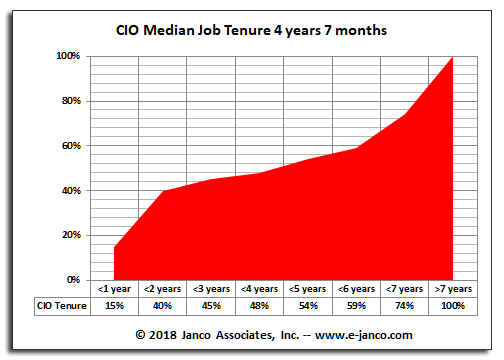 As a result we feel the median length of employment for the CIO position will increase any time soon. The good news is that there will opportunities of others to move into those positions. CIOs both visionary and pragmatic - It is not enough to plan for innovation, the CIO needs to be perceptive and realistic. As an insightful manager, a CIO promotes broad technology agenda to help the business profit from leading-edge initiatives. At the same time as a pragmatist, a CIO deals with the realities of the business. The pragmatist also facilitates the productivity of current IT solutions. The CIO focuses on minimizing cost and maximizing results, in addition the CIO helps to increase the customer and product/service base of the enterprise. CIOs focus on ROI improvement of IT - CIOs will find new ways to help customers and the organization profit from how data is used while focusing on managing budgets and processes to eliminate or reduce costs. CIOs inspire the enterprise and expand the business impact of IT - CIOs will have proven expertise in both business and technical facets of their role. CIOs will interact with the enterprise and its executive team as enterprise leaders and drive new business initiatives and shifts jointly the other members of the executive team. At the same time the role of the CIO and CTO is changing as more enterprises more towards a "Value Added" role for the Information Technology function. Those changes are depicted in the detail job descriptions that have been created for all of the functions with IT -- especially for the CIO and CTO. 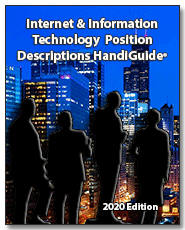 You can purchase this book as a PDF Book, Word Book or as individual word files for each Job Description (in Word .docx format) which makes for easier modification. We have also combined the both book formats with the individual word files for each job descriptions to give you the best of both worlds.